Are you looking for some options to treat your Parkinson's symptoms that go beyond simply taking more medication? Are you skeptical that adding a regular exercise program, or switching up your diet can actually make a dent in your symptoms? If so, I have a special treat for you today. Colin Potter, founder of Fight-Parkinsons.org, has been diagnosed with Parkinson's since 2011, after 3 years of progressive symptoms. At age 61, his symptoms had progressed to a point where he was dragging his feet, not swinging his arm, his writing was small, and his rigidity was so intense it would take over 20 minutes just to get out of bed in the morning. "Is this it? Is Parkinson's going to be the end of me?" Fortunately, he decided it wouldn't, and set out on a journey to find answers that the medical community couldn't give him. What he found was how significantly our daily lifestyle and environment contributed to neurological system disruption. I've spoken with Colin before about how he began changing his nutrition, supplementation, exercise program, and focusing on toxin elimination to help him reverse a large portion of his symptoms. In this interview, I brought Colin back on for an interview to talk more about his journey and what specific steps he took to regain a feeling of freedom and empowerment in his life, despite his diagnosis. Press play above to watch. Closed captions available (Click on "CC" at the bottom right). 45:20 - A recent victory that Colin was very excited about! 55:55 - Answer to the question "Do I have to go 100% for these efforts to be worth it?" 1:00:10 - Constipation, Urinary Frequency, and Colon Hydrotherapy… oh my! Staying Hydrated with Parkinson's - Going Beyond Simply "Drinking More Water"
You can thrive, despite your diagnosis. Have you been diagnosed with Parkinson's and want to start taking powerful steps to address your symptoms without taking more medication? 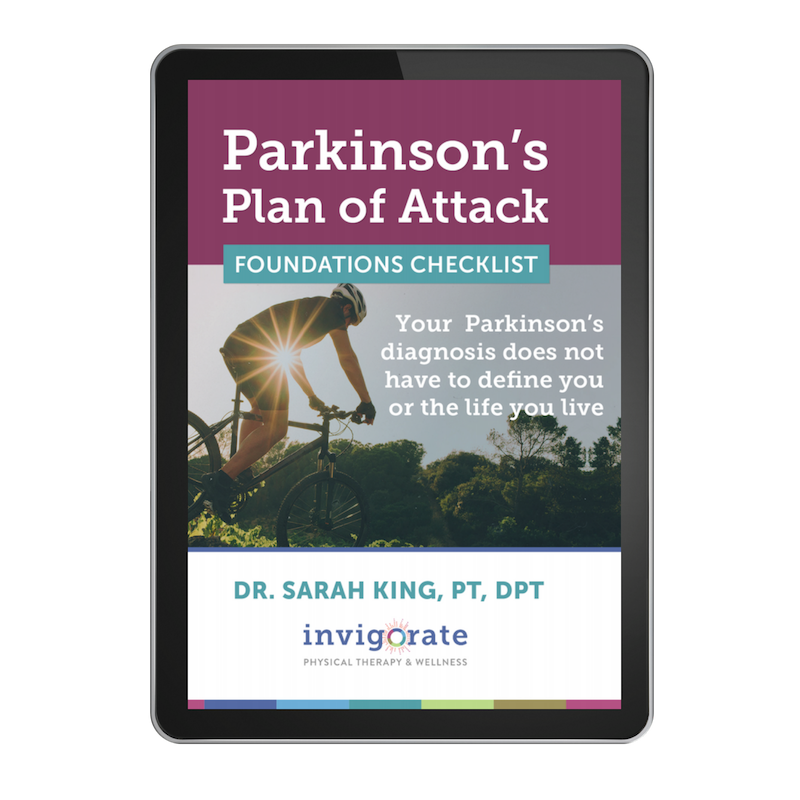 Snag a free copy of Sarah's "Parkinson’s Plan of Attack Foundations Checklist” below to start your journey today.